It’s Sunday Foreign Food Talk. How I’m Staying Cool &amp;... – Juka's Organic Co.
It’s Sunday Foreign Food Talk. How I’m Staying Cool & Hydrated In This Cali Heat As Done In Africa. We call it “Boi” in my native language while the West calls it Baobab Fruit Powder. Grows from one of the largest trees in Africa. The Baobab tree can live as long as 5000 years and the trunk can reach up to 82 feet in circumference. I grew up making shakes and pop sickles and refreshing drinks from this miracle fruit powder. Up to this date, I can never get enough of it, because it’s so yum and it keeps you hydrated! The baobab fruit looks like a large velvety-green coconut oil in the outside, but once open the photo above is what you get. 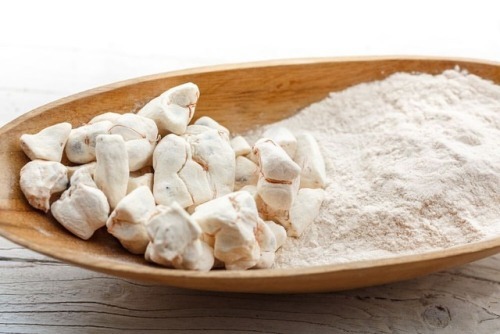 The powder is then extracted to used in many desserts recipes but must importantly for it’s many healing properties.